The name of Norman Schwarzkopf, Jr. ought to be written in golden letters in the list of Army Generals that have served in the United States Army.The man served from the period of 1956–1991 and is considered to be one of the finest soldiers ever.Born in New Jersey, Schwarzkopf Jr. had Herbert Norman Schwarzkopf, Sr. for father, who was a veteran of the World War I. Hence, army values were instilled in Norman from home itself and later on he went on to play the role of Commander-in-Chief while leading all the coalition forces in the Persian Gulf War. 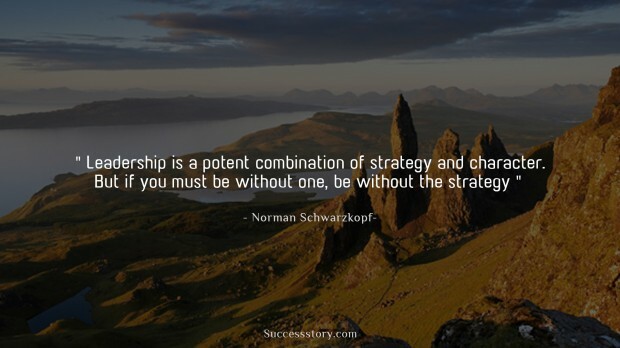 "Leadership is a potent combination of strategy and character. But if you must be without one, be without the strategy." The Miracle Cure for Whatever Ails You? Get Organized!